Hello friends! Maryám here to share a new project using the digital exclusives files of this month. If you are a subscriber you can find them here, or if you are not a subscriber you can them here. As you can see on the right side of the spread I put my photo, the title and some embelllishments, but on the left side of the spread I decided to create a kind of a pattern paper using the flowers printables of this month. 1.You have to open a new file on photoshop with the size of your travelers notebook’s page. 2. Now, you have to go to “file” and then click on “place”, in that way you will can add the png elements that were included on the printables folder. 3. Once you have the flowers right on the file, you are going to duplicate the layers over and over again. In that way you will create your own pattern. 4. If your pattern it’s done, save it, and send it to print! The camera is from a chipboard sheet from the beautiful Oasis collection, and the leaves are rubber shapes from Pinkfresh Studio. I hope you liked my pages and if you have any questions, please put them in the comments below. Categories: Geek Lab | Tags: Ck printables, CKJune2017, geek lab, Maryám Pérez, traveler's notebook | Permalink. Hello scrappers and welcome back to the blog! Today I have a fun layout to share using the June Aquarelle Main Kit. I am in love with the colors in this kit – from the soft blue tones to the watercolor accents. This kit is stunning! Here is the layout I made using this fantastic kit along with the exclusive Clique Kits “Shine Like the Stars” cut file to serve as my title. I love using cut files as a way to create interesting titles and accents. And to be honest, I am sort of a lazy scrapper and I rely heavily on tools like cut files as a short cut to creating fabulous layouts! I cut this digital cut file using my Silhouette Cameo (suitable to cut with other electronic cutting machines such as a Cricut). Because of the delicate detail of this file, I adjusted the cut settings in Silhouette Studio to a speed of 2 and to a thickness of 31. This ensured that the middle words “like the” would cut without issue. I initially cut this image on dark blue card stock but I just didn’t like the look of it once I placed it on the layout. I wanted the cut file to mimic the navy blue watercolor accents that are featured in the die cuts and frames that I used on the layout. To remedy this, I cut the file a second time on white American Crafts Textured Cardstock and painted the cut file with Kuretake Gansai Tambi watercolors to create a navy blue ombre effect. I used extra water to spread the paint, starting with a dark shade of navy blue at the bottom of the cut file and working my way up. Once I finished painting the image, I used a heat tool to dry the cut file. When the cut file was completely dry, I adhered it to my layout using Tombo Mono Aqua Liquid Glue. The result is a stunning title that coordinates perfectly with the accents featured on this layout! 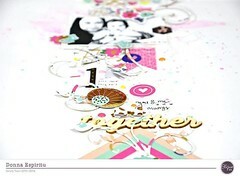 Using cut files is a simple way to add high impact to a scrapbook layout without much effort! Once the title was in position, the remaining accents of this layout came together rather quickly. Haven’t tried a Clique Kits exclusive cut file? Wait no more! Head on over to the CK store, download a few cut files and give them a try! Until next time, make it a great scrappy day! Categories: Geek Lab | Tags: CKAquarelleKit, Digital Cut Files, exclusive cut files, geek lab, Tools, Victoria Calvin | Permalink.